Stuart Tucker joined the Australian online marketplace for buying and selling trades services last October as inaugural chief customer officer, uniting the marketing, sales and services teams. Prior to this, he spent four years with CBA, and boasts of a 30-year career as a marketer for the likes of Optus, KFC and Aussie Home Loans. While Hipages has certainly experienced significant growth since launching 14 years ago, with 2 million consumers using the platform and a 37 per cent increase in year-on-year revenues to $37 million in FY17, Yet Tucker said it was clear the company lacked a well-articulated point of difference in the market. And it was suffering from below-average brand awareness as a result. So Tucker and his team got behind the notion of category design, as detailed in the book, Play Bigger, written by the founders of a Silicon Valley advisory firm of the same name. At its core, category design is about taking rational steps to define the space around a company and its product offering so customers not only understand products better, they demand them. Authors, Al Ramadan, Dave Peterson Christopher Lochhead and Kevin Maney, describe it as the opposite of a ‘build it and they will come’ mentality. In hipages’ case, the insight was the need to improve the relationship between tradies and consumers. The market size is also huge. Tucker pointed to fresh research by hipages in partnership with Ernst & Young Sweeney and LEK, which showed 70 million trades jobs being completed in Australia per year – an average of seven per house per annum. “We pay tradies $73 billion a year, not including materials… yet it’s an industry still anchored in old-fashioned ways,” Tucker said. “It’s incredibly fragmented, it’s diverse – you have everything from builders to pest control and everything in between – and it hasn’t really been disrupted. There’s certainly not enough use of digital to improve and become more efficient. Using the research and category design principles, hipages has defined the ‘on-demand tradie economy’, and reoriented its brand purpose and company mission, product roadmap, and marketing and communications around owning this market. “The greatest marketing activities are those grounded in a consumer problem. The beauty we have with a double-sided marketplace is that the problem is shared, which makes solving it even more powerful,” Tucker said. Hipages releases a whitepaper on the subject this week. But the first external iteration of this new category is the national mass-market campaign launched on 12 August. Running across digital, print, broadcast and outdoor, ‘Change the way you tradie’ centres around hipages’ app features, such as matching homeowners with qualified tradespeople and assigning reliable quotes, using photos to upload jobs, helping schedule appointments and arranging payment and checking customer ratings and recommendations on tradies. It’s been crafted in partnership with creative agency, VCCP. Hipages covers more than 240 categories and has 135,000 qualified tradespeople available nationwide, with more than 100,000 jobs per month posted on its site per month. It’s a big investment for hipages, and Tucker said getting the brand campaign over the line meant building a strong case for incremental media investment. “It’s pretty easy with brand research to show where we stack up in terms of awareness, and that showed a gap to where we really should be. We were able to also show where other marketplaces had been spending money to grow their brands and some of the outcomes of that,” he said. “And we proved that if we were going to fuel growth, and become known as the category leader, we had to get ourselves out of the limited media we’d been doing. The campaign launched during TV show, The Block. The team is also tapping into media provided by News Corporation, which owns 30 per cent of the business, to create a bigger presence than Tucker said you’d normally expect from a brand of this size. While the tech behind hipages might be new, Tucker said he’s taken quite a traditional approach to the media mix. “We know 75 per cent of Australian households use a tradie every year - it’s not a niche market. It’s also a market slightly older than other brands in digital, yet those [next-generation companies] are still consuming traditional media,” he said. 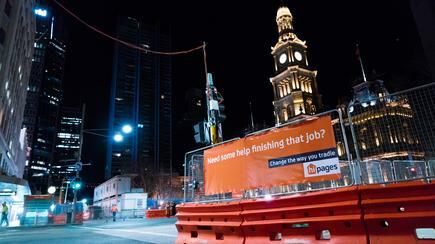 These guerrilla tactics included banners on unfinished construction and lightrail sites in Sydney and Melbourne posing the question: ‘Need some help finishing that job’? Tucker said early results are highly positive. “We’ve seen significant increases around metrics that count the most – such as downloads of our app; plus significant shift in unbranded to branded search – people actively looking for hipages, rather than searching for a plumber in their local area. On the other side of the market we’ve had 2.5 weeks of record sales for new tradies wanting to join the platform,” he said. Getting buy-in meant starting at the board level, which thankfully was marketing and media savvy and supported the need to invest in a longer-term brand play. Next up was engaging the senior leadership team in the original creative idea. Tucker said it was then a matter of “just getting on with it”. Another key priority is being agile and responsive to the market and current affairs, and Tucker pointed to hipages commenting on the Prime Minister battles of a few weeks ago as an example. “If we’re going to be a disruptive brand, and challenge the way people tradie, we need to be jumping in on conversations and real-time events to make that happen,” he said.